It is the future. The world has changed. Crime has not. Welcome to the not-too-distant future of the Android universe. Your ticket? 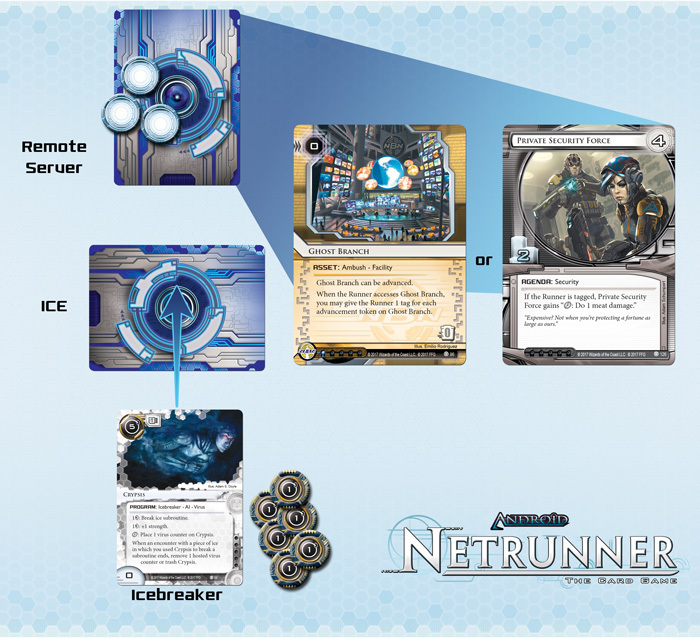 The Revised Core Set for Android: Netrunner The Card Game! 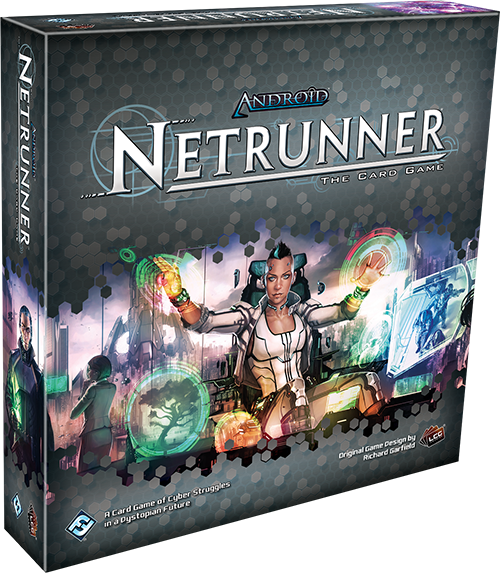 Do you already play Android: Netrunner? Click here to learn what the Revised Core Set means for rotation and tournament play. With more than 240 cards, the Android: Netrunner Revised Core Set transports you to an age of sprawling megacities. Here, artificially intelligent bioroids and genetically modified clones work alongside cyborgs, g-modded humans, and naturals. Hoppers pass overhead in their skylanes, and in New Angeles, a Space Elevator most commonly known as the "Beanstalk" dwarfs neighboring arcologies and skyscrapers as it reaches beyond the Earth's atmosphere and gravity to serve as a low-cost launch for near-space travel. This is a future in which humanity has colonized the moon and Mars. Gone are the days of the mouse and the keyboard. Most users transfer data via gestural interfaces and virtual displays, but the elite take advantage of the advances in human-machine brain interfaces to "jack in," connecting their brains directly to their computers, and beyond them, the omnipresent network. Everyone relies on the network, the all-seeing, all-hearing grid that surrounds Earth and reaches out into the solar system. More data flows through the network every second than was ever expressed in the first five-thousand years of written language. It is a surveillance network, a financial system, and a library. It is the backbone of modern civilization. And it is a battlefield—the scene of countless struggles between the megacorps that want to conceal and secure their agendas and the talented hackers, known as "runners," capable of breaking, bending, bamboozling, and otherwise bypassing those defenses and stealing those corporate secrets. Soon, if you have never played Android: Netrunner, the Revised Core Set will offer you the chance to boot up and jack into the greatest game of high-stakes cybercrime the world has ever seen. If you have played, you will find that the Revised Core Set sets a new standard, pushing the game into the future—adjusting the base card pool, altering the battlefield, and aging your favorite characters. 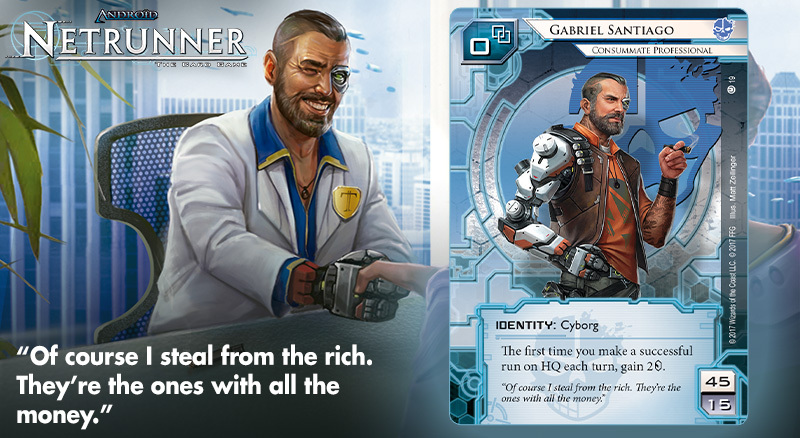 The classic Living Card Game® of asymmetrical bluffs, counterbluffs, and economic struggles, Android: Netrunner pits two players against each other in a tense, cat-and-mouse duel for the control of valuable data. One assumes command of a vast, monolithic megacorporation and its nearly limitless resources while the other steps into the shoes of a talented cybercriminal—known as a "runner"—who hopes to bypass the corp's defenses and unlock its secrets. In both cases, the goal is to score seven points. The corp scores points by advancing and scoring its agendas. The runner scores points by stealing the corp's agendas. But while your goals are clear, your path to victory is shrouded in mystery. Much of the game revolves around the use of hidden information. If I have the classic Core Set, do I need the Revised Core Set? The Revised Core Set establishes the new baseline for Android: Netrunner, but it does not introduce any new cards to the game. Players who already own the Core Set, along with the Data Packs from the Genesis Cycle and Spin Cycle will already own all the cards from the Revised Core Set. The card art and card quantities in the Revised Core Set, however, vary in places from those in the classic Core Set and Data Packs. The corp plays—or "installs"—its cards facedown, only to "rez" them as the runner crashes into them headlong. These may be the agendas the runner wishes to steal, or they could be the layers of ice with which the corp intends to protect its servers—powerful defensive programs that might end the runner's attempts at infiltration, tax the runner's resources, or deal lethal (and illicit) damage. The corp can also build its servers around cards other than agendas, using them to secure valuable assets or to bait runners into damaging traps. The runner, meanwhile, is always threatening. No server is ever one-hundred percent safe. Even a corporation that protects its HQ with several layers of the world's most advanced ice may find itself vulnerable to hacks the runner routes through its Archives. As the Corp player, you can only do your best to defend your servers against the programs you can see and the programs and events you think the Runner can play with his or her limited credits. As the Runner, you'll want to prey upon the Corp's fears, tempting them to pay for defenses you'll later ignore or bypass with ease. You'll need to decide how much early risk you'll assume in order to gain critical advantages later in the game. Running against the Corp's remote server leaves the Runner vulnerable to two of the Corp's facedown cards—the layer of ice and the card installed in the server. The gambit could pay off, and the Runner could score valuable agenda points. Or it could backfire, leaving the Runner tagged, injured, or even flatlined. Naturally, as your struggles are so highly influenced by the cards your opponent plays, has played, or could play, the pool of available cards makes a tremendous impact. And, here, the Revised Core Set sets the tone with a collection of 247 player cards, 133 Corp cards, and 114 Runner cards. These card pools are further divided among the game's seven standard factions, each of which brings its own style, strengths, and weaknesses to the table. While the corps are identified by their achievements and ambitions, the game's runners are identified by their motives. They don’t build up. They tear open. But they don't all run for the same reasons. Anarchs like Reina Roja are inspired by their hatred for corporate corruption. Some might say they champion the oppressed and the downtrodden, but they're just as likely motivated by the pleasures of ripping apart corporate lies and spreading their viruses to hinder the corporate machine. Shapers like Chaos Theory are considered idealistic naifs by many. They’re not in the business to tear down corporations nor for personal gain. They run because they can. There are freedoms they enjoy on the net that they can't find elsewhere, and they may take joy runs simply to see what they can do with new combinations of hardware and software. Their tech is almost always among the most modded and sophisticated in use. Our upcoming previews will provide you more information about these factions, their strengths and weaknesses, the ways they interact with the other factions, and the design choices guiding their Revised Core Set card pools. 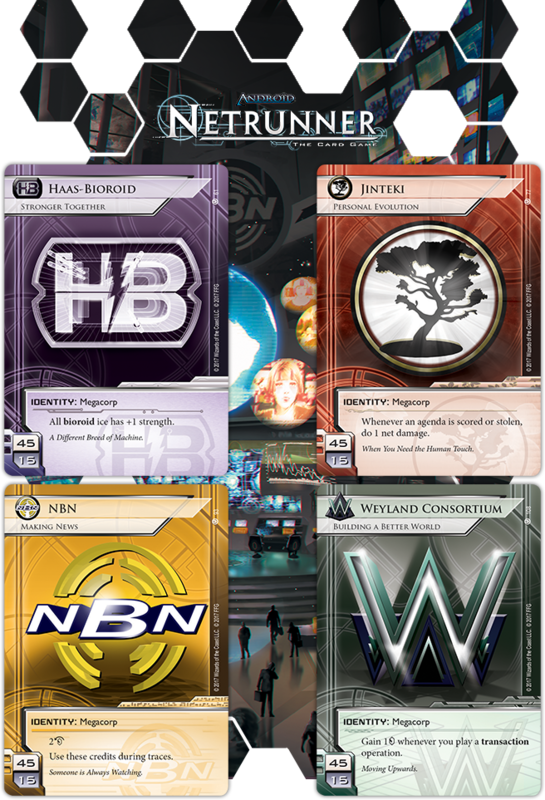 The different factions and asymmetrical game play of Android: Netrunner create entirely different experiences for corporations and runners, and from faction to faction, but in all cases, you gain an unprecedented amount of control over the flow of the game. Tension builds immediately from the very outset as you and your opponent maneuver through your turns. And the deeper you dig, the more you'll find your bluffs, calculated risks, and assumed losses all coming to bear. In the future of the Android universe, megacorps and runners vie for control of reality. You'll soon have your chance to make a difference. The time is coming to boot up and run. The time is coming to break the ice. 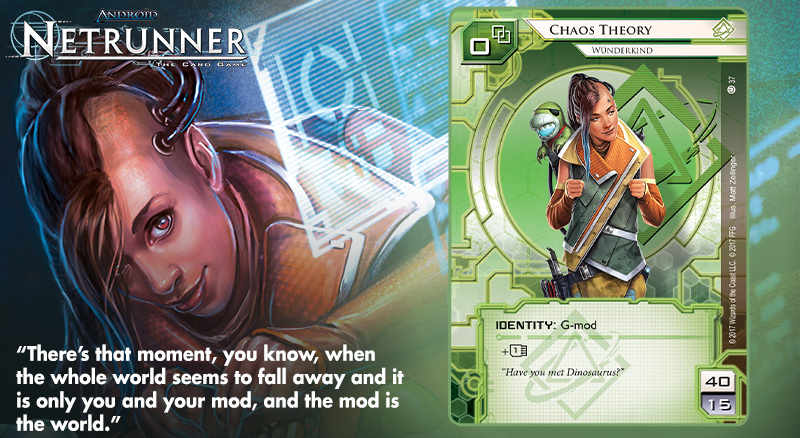 The Revised Core Set (ADN49) is your ticket to the world of Android: Netrunner and its high-stakes cybercrime. Head to your local retailer to pre-order your copy, or click here to pre-order your copy from our webstore!